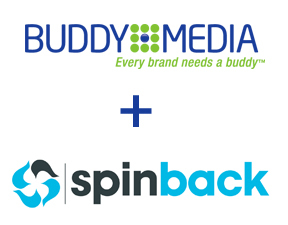 As the news says, today my partners and I over at Spinback are pleased to announce that we’ve been acquired by Buddy Media, the Facebook management system of choice for eight out of the ten top global advertisers. When we started Spinback the goal was to build the most cutting edge technology that would facilitate conversations and sharing of products. More importantly, we wanted this technology to also track how word of mouth marketing affects new sales and new customer acquisition. Now as a part of Buddy Media, we will have all the tools and infrastructure necessary to accelerate our collective mission which is ultimately about leveraging this new social web in new and interesting ways for leading companies around the world. We are really excited to begin the next chapter and I’ll leave the rest of the details to Buddy Media. All Things Digital – Facebook Pal Buddy Media Buys A Startup. Isn’t Selling to Facebook. Well deserved congratulations, Mr. Reich. Certainly no surprises about your success. I look forward to the ‘next one’.